I was watching the Australian Open during the week and caught some of 3-time champion Novak Djokovic’s third round match. However, as the match went on, I became more fascinated by the back story of his opponent, little known Uzbek, 27 year-old Denis Istomin. When he was 14, Istomin was in a horrific car accident on the way to a junior tournament, resulting in a severely broken leg. After 80 stitches and three and a half months in hospital, doctors said that he would never hold a tennis racquet again. Normally, that would result in the end of someone’s professional tennis aspirations, but not for Denis. This is where his mother, Klaudiya, enters the story. Over time, with the incredible support of his mum, Istomin started to believe that he could become a professional tennis player and the resilience that he developed during this period has helped him to rise to as high as 33rd in the world and so far, he has earned over $2.7 million in prize money. Although Denis Istomin may never be world number one, win a grand slam tournament or become a household name like Roger Federer, Rafael Nadal or Novak Djokovic, he inspires me with his resilience and resourcefulness. And Klaudiya, who is now his coach, is an inspiration for believing in her son and helping him to reach his goal of becoming a professional athlete. I don’t know what your circumstances are. Perhaps something has happened in the past that has caused you to give up on your dreams. Maybe it’s time to pick up the racquet again and start making progress towards your goals like Denis Istomin did. Or perhaps there is someone in your life who has been held back by their past. Maybe you can be like Klaudiya and encourage, coach and inspire them to get back on track. 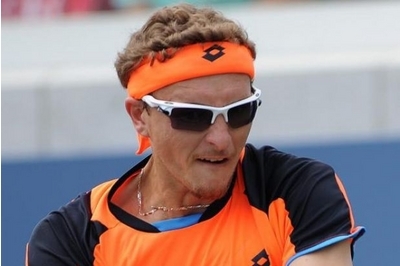 Great story about Denis Istomin. What a powerful tribute to a mother’s love and a son’s resilience and determination to work toward his goals. This story has has really sparked my interest in a player I hadn’t known too much about before. I will come back to this article frequently as I seek inspiration to pursue my own goals in the future. I will think of Denis and never give up and of Klaudiya and help someone else in an area of knowledge and interest. You’re very welcome, Darren. I saw an interview with Denis Istomin and he is a very intelligent man, in addition to being a good player. He spoke very highly and accurately of his colleagues in tennis, particularly Roger Federer and David Ferrer. Wow! Happy 28th Birthday to Denis Istomin! I plan to do a speech in Toastmasters about Denis, entitled “In Tribute to His Mother’s Love,” about the power of his mother’s love and his own determination to succeed despite the formidable odds against him. Even though he has been struggling lately with injuries, what he has been able to accomplish by making the professional tour is still extraordinary. Even though he may not be a “household name” like the Big Four (Federer, Nadal, Djokovic and Murray), he is a well-loved name in the Istomin household and that made all the difference in his life. Congratulations on your first title, Denis! Your victory was hard won and well-deserved. I knew good things would happen for you! The best is yet to come. Congratulations Denis for your victory in Australian open! Sending joker home is real victory! Congrats to mother who is responsible for your success! God bless mother and son! Denis, your victory against Djokovic was the ultimate triumph! Your interview afterward was wonderful to see! Congratulations, Denis! You have overcome so much and your victory is well-deserved. You showed those who nearly wrote you off that, with your determination to succeed and your mother’s love, great things can happen.